Oval - This is what you get when you buy a train set. a simple oval of track so the train can go round and round. most modellers dislike this kind of layout as in small layouts it does look like the train is chasing its own tail. also unless you have a large layout your train may seem like they are always on a bend and it does not look very realistic. 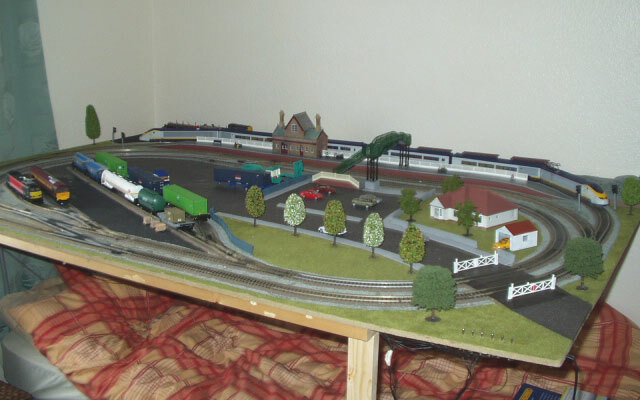 This layout is however the best place to start and will allow you to run the trains without having to change direction. Covered oval - This is the same as an oval track but the modeller only allows you to see the trains on the front section of track. Usually at both ends of the board, the railway enters a tunnel hiding all the track (usually lost of sidings filled with trains behind scenery. This makes the layout more realistic as the trains can enter the tunnel and stay in there for a while before coming back out. It is usual on this layout to have your main sidings hidden away in the tunnels with different trains in each. This means the train that you bring out of the tunnel may not be the one you just sent in. It is favoured by many modellers. This layout allows the modeller to build up a realistic scene where trains aren't going round and round. 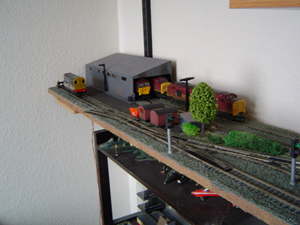 The layout above and below shows a set of sidings with an EWS maintenance building. You can run the locomotives from one siding to another, you can use the shunter to arrange a set of wagons in the sidings ready to be taken away by one of the big goods locos. Best of all, the railway is an interesting thing to look at, seeing something new every time you look at it.